Multiple times a day in our Fly Shop, we are asked how to cast a fly rod, what the difference between a “leader” and “tippet” are, and how to tie on a fly. Answering these questions is one of our favorite things to do, because we know that you have chosen us to help you in your journey of learning how to fly fish. 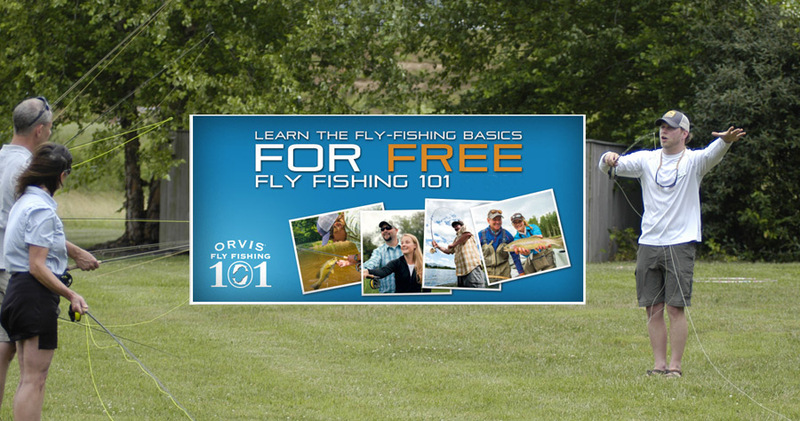 This free two hour course was designed by Orvis to give you your first glance into the world of fly fishing. In it we will cover all the basics to enable you to cast a fly to a fish, and we will explain it in a way that anyone can understand. We start the class by explaining why we fly fish, and what the difference is between spinning tackle and a fly rod. As the course progresses, you will learn the ins and outs of a fly rod, reel, and line. You will learn how to cast a fly rod and practice being accurate. We will also teach you how to tie a couple of knots that you need to know, and give you plenty of time (and good lighting) to practice them. The instructors who teach this class are patient, experienced, and professional, and they are enthusiastic about teaching you the sport that they love so much. We don’t use this class to confuse you with a bunch of new terms – we use it to simplify things and to introduce you to the sport and to our school. Check our schedule for our next class, and please give us a call at the shop to sign up as class sizes are limited. We can also hold free Orvis Fly Fishing 101 classes for private groups and can usually schedule them at any time, just drop by the shop or call us at (865) 448 – 9459 and we can help you get signed up. Please call the shop at 865-448-9459 to reserve your space. Copyright 2006-2019 Little River Outfitters, Inc.